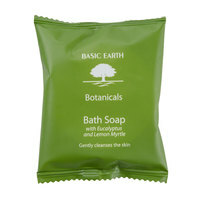 Basic Earth Botanicals soap products is designed for luxury. These soaps come in fresh, clean scents like eucalyptus and lemon myrtle to relax guests as they bathe. In order to keep their rooms fully stocked, you can offer them soaps designed for different uses, as well, like washing the body and face or massaging and exfoliating as it washes. Each bar comes in a different size, so you can choose the option that works best for your business. 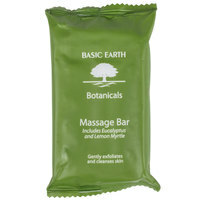 Basic Earth Botanicals soap products are perfect for your hotel, motel, spa, or resort. These high-quality soap bars not only cleanse and nourish your guests’ skin as they bathe, but they’re also good for the environment. Both the packaging and soap are 100% biodegradable, reducing your business’s negative impact on the earth. For other products to ensure your guests remain clean and comfortable during their stay, check out our hair products, bath amenities, and facial tissues. 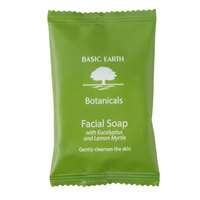 If you're wondering where to buy basic earth botanicals soap and products, we have a large selection of basic earth botanicals soap and products for sale at the lowest prices.